She wears some barkeep clothes and a pair of shoes. 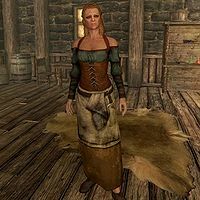 She wields a leveled dagger (up to elven) quality), and carries a key to the bunkhouse, along with a selection of lower-class items and gold. Esta página foi modificada pela última vez à(s) 12h04min de 18 de junho de 2014.